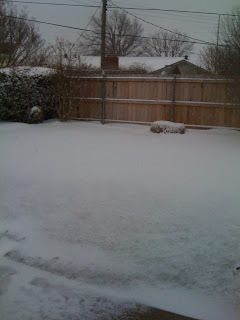 The Murphy Journeys: Feels like Winter! So today is technically the first day of Spring but it sure feels like Winter! Unbelievable! 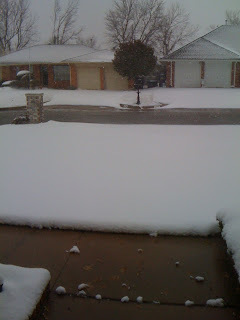 Here's a few pics of the snowfall we've been getting all day and it's still coming down! 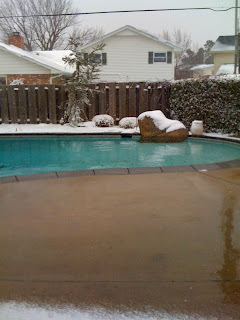 Yesterday, we had 70+ degree weather and today is snowy and freezing outside...only in Oklahoma! I couldn't be more ready for Spring to arrive! Kyle and I are just hanging out at the house and doing all sorts of projects that are on the to-do list to get done before Kate's arrival. The nursery is coming together - slowly but surely (I'll post pics soon) and there's tons of other home improvement projects that we've decided to tackle! Feeling lots of movement from Kate today which is crazy weird but fun! She moves around quite a bit and usually wakes me up in the morning with her movements. Oh...and speaking of Winter (and since I feel the need to play a little catch up on life's happenings since I just started this blog), I've posted one more random pic from our company's holiday party! I"m so proud of our crew and think we make an incredible team! This is everyone that works to make Brides of Oklahoma and Brides of North Texas what it is -- and, their spouses! There's one new person missing - Gerardo (our web and software developer) -- but he wasn't with us over the holidays! From left to right, Kami (my business partner) and her husband Eric, me and Kyle, Alli (mag editor and bride editorial director) and her husband Brian, Carri (sales and production executive) and her significant other Spencer, Meagan (TX sales executive) and her significant other Jason. 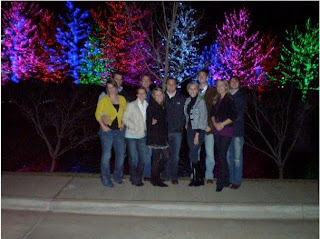 We all went to eat at one of our favorite restaurants, Iron Starr, and then had King's Limousine (one of our awesome partners) take us around town to look at Christmas lights! Cheers and please bring on Spring!!! !